Associate in Arts (AA) and Associate in Science (AS) degree students are required to complete coursework that addresses the General Education goals of Ethical Reasoning and Action (E) and Information Literacy (IL) in addition to completing courses from the above identified knowledge areas. (E) and (IL) goals are integrated in a limited number of General Education courses. AA and AS students must complete at least one General Education course that contains the (E) integrated goal, and at least one course that contains the (IL) integrated goal. AAS students are required to complete course(s) that integrate (E) and (IL) competencies and may fulfill this requirement through General Education or other program requirements. Students should choose their general education courses based upon the degree sought and their transfer plans. Student Development Specialists (Counselors) work with students to design a plan of study. General Education courses are identified in the course description section of the catalog and are listed below. (1) Students must take 3 credits in Humanities and 3 credits in Social Sciences, plus an additional 3 credits in either category for a total of 9 credits. (2) A laboratory science course is required for A.A. and A.S. degree students. (3) Students must complete a minimum of 12 credits for the AA degree and 9 credits for the AS degree to fulfill the requirements for the Mathematics (M), Sciences (SC) and Technological Competency (IT) knowledge areas. (4) Technological Competency can be satisfied by program requirements other than General Education. Students may take an assessment to demonstrate their technological competency and increase the number of credits completed in mathematics and science. Students should consult a Counselor. (5) Students meeting this requirement while simultaneously fulfilling the General Education requirement for another knowledge area will need to take three credits from any General Education knowledge area to satisfy the 45 credit requirement for the A.A. degree. (6) The number of required General Education credits are the minimum; the actual number of credits completed may exceed the minimum. A description of the General Education courses that meet the requirements of each General Education category are described in the Programs of Study section. Institutional learning outcomes are the skills and abilities all degree-seeking students are expected to acquire upon degree completion. They represent the general education model as articulated by the Middle States Commission on Higher Education (MSCHE) and the New Jersey State Community College (NJCC) General Education requirements. Students will acquire these learning outcomes as appropriate for their degree type. 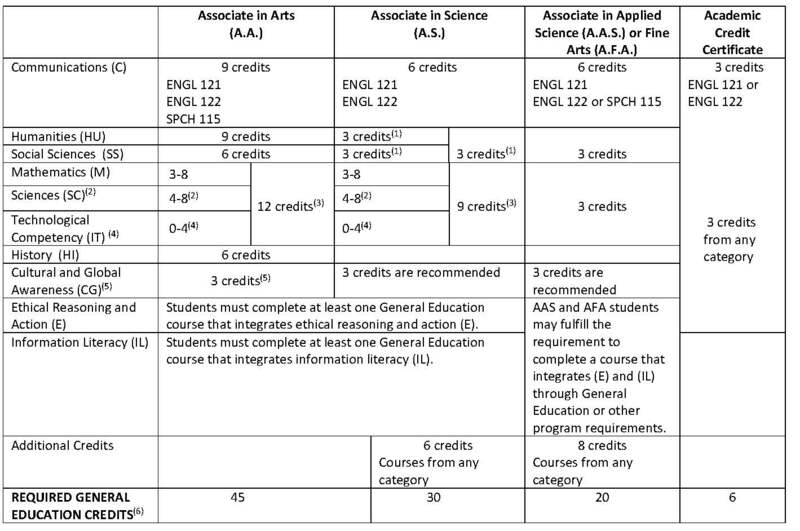 Specialized degree program requirements (A.S. and A.A.S. degrees) will be comparable, though not necessarily identical to the institutional learning outcomes listed below. Students will analyze works in the fields of art, music, or theater; literature; and philosophy and/or religious studies; or will gain competence in the use of a foreign language. Students will understand ethical issues and situations. Students will address an information need by locating, evaluating and effectively using information. * Under the NJCC General Education Foundation (2011), critical thinking is embedded in all goal categories.